One of the major updates that came in the Q2 2018 SuccessFactors release was Candidate Relationship Management (CRM), a new functionality that aims to improve the job search process on both sides through better applicant engagement and an easier recruiter experience. The CRM functionality, which is now available for customers who have both SuccessFactors Recruiting (RCM) and Recruiting Marketing (RMK), offers unique campaign landing pages and dynamic data capture forms to raise candidate conversion rates, forms targeted talent pools to identify the most sought-after candidates, provides easy-to-use interfaces for non-technical recruiters to build email marketing templates and campaigns, and creates a single view of the candidate though all data sources, from engagement, activity, history, and profiles. SuccessFactors made a point to highlight CRM at SuccessConnect in Berlin, where it showed off many of its latest updates and upcoming innovations. Let’s dig deeper into the new features and how they will help recruiters better find and secure the best candidates. CRM allows for specific campaigns where recruiters can build forms right in Career Site Builder without extensive technical expertise. Additionally, SuccessFactors CRM provides a user-friendly interface for creating email marketing campaigns. Benefits: Specific marketing campaigns allow recruiters to capture the information and attention of passive candidates. The email campaigns build on that with personalized reach out and tracking. Recruiters will be able to build talent pools in SuccessFactors CRM and indicate if those pools are private or can be shared. Benefits: Talent pools remove the need for evergreen or sourcing requisitions and allow recruiters to directly manage candidates and keep them warm. Sharing pools means simple collaboration and engagement. SAP SuccessFactors Talent Pools interface. SuccessFactors CRM allows for candidate pipelines to be created. 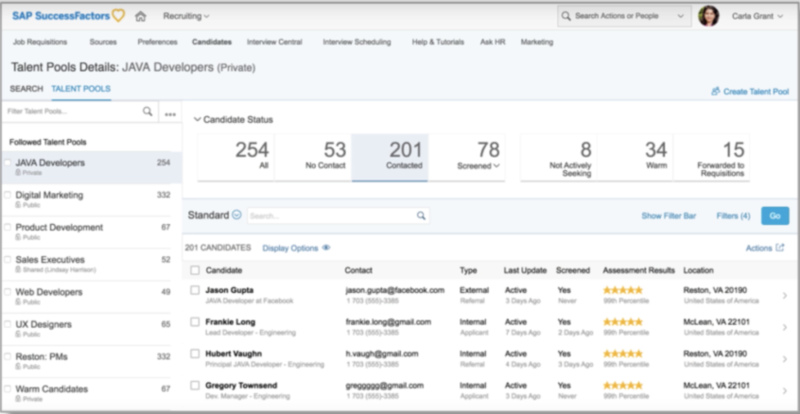 It also provides a single view of the candidate across recruiting modules. Benefits: Theoretically the candidate pipelines allow a recruiter to take a candidate through the whole recruiting process before even creating a requisition. With single view of the candidate, there is no need to navigate through several sections of RCM to get a full history on a potential employee. There are recruiting key performance indicators (KPIs), such as time-to-fill, cost-to-fill, percentage of hires from source, recruiter time tracking, and a candidate satisfaction survey built directly into SuccessFactors CRM. Benefits: Recruiters will find it much easier to track recruiting and recruiting marketing performance across functions. From a recruiting perspective, SuccessFactors CRM has been an ask for numerous customers over the past few years. As the market has grown and unemployment rates dropped, finding quality candidates has been a challenge. Often times, recruiters are losing candidates simply due to the fact that other organizations are moving faster in their recruiting process because of pre-existing relationships. CRM will allow recruiters to source candidates, build a relationship with them through e-mail and conversation, and then when the right position is open can use that relationship to quickly hire the candidate. In addition, the metrics that will be available provide insight into recruiters’ efforts, the value of advertising, and the relationships they’re building with their candidates. The days of recruiters simply waiting for candidates to apply are dissipating. The focus for recruiters has shifted back to a sales role—selling the organization and engaging the candidates early on in the process to secure the best talent in today’s competitive marketplace. Contact /N SPRO to find out how your company can improve recruiting and get the best talent with SAP SuccessFactors.